I wanted to write about some exciting recent Orbiter developments, especially the rapid progress of Francis Drake's and Simcosmos' add-ons for NASA's CEV, LSAM, CLV, and other components of the Vision for Space Exploration (lots of details, downloads, and pix in this long post). I was also thinking of writing up a summary of my December blog entries, an idea borrowed from Anthony Kendall, but it's almost time to pick up the Chinese food and settle in for a low-key New Year's Eve with the family. So I'll just wrap up the month with a few words - tomorrow's another year, after all. Although special interests and hobbies have come and gone for me, space is something that has been in my thoughts and dreams literally since childhood, and 2005 has been a great year for space and for my personal interest in it. 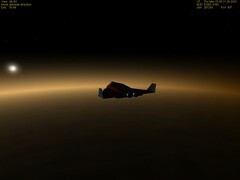 In March I discovered Orbiter, the freeware space flight simulator that continues to amaze me almost daily. Over the summer I wrote a 136 page tutorial book about it, and I started a personal campaign to use Orbiter as a tool for science education and to raise interest in space exploration. I also wrote an article about Orbiter for The Space Review. I started this blog in October, and through Orbiter, the Orbiter forums, and the blog, I have met (at least on line) a number of amazing people and made some new friends who share some of my interests and concerns. The resulting dialog has been fascinating and has taught me a lot about more than just space. And of course the background for all this is that things are moving again for real space flight. 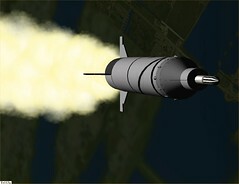 The Shuttle returned to flight in July, and NASA fleshed out its plans for returning to the Moon and eventually to Mars. Although I'm impatient with the schedule, I'm still supportive and excited that it's happening. I'm also excited to see the many developments in private ventures for space, as well as active space programs in other countries. As I wrote early in this blog, let a thousand space programs bloom. Whether any particular project or venture will succeed as planned or not, I don't know - but some will succeed. For the first time in many years, the idea that we will become a spacefaring civilization seems like it is moving beyond science fiction. As Carl Sagan pointed out, this is an amazing time to be alive. It's the dawn of a new age. Although I read plenty of "adult" SF and many other categories of books as well, one of my favorite genres is science fiction that's intended for young readers. And for some reason, many of the books I like are in the post-apocalyptic SF sub-genre, i.e., plucky kids trying to save or rebuild the world after war, alien invasion, or some other disaster. Ender's Game is a prime example, and also John Christopher's Tripod Trilogy (starting with The White Mountains). Another favorite is The Last Book in the Universe by Rodman Philbrook. I won't try to psycho-analyze why I like these books so much, but I just found another really good one, The City of Ember by Jean Deprau. I bought it some time ago, but just happened to spot it on a shelf this week. This was a fortunate procrastination, because in the meantime, the sequel The People of Sparks came out, and I bought and read that too. Ember is an underground city powered by an underground river that drives a huge generator. It was created by "The Builders" and stocked with a 200 year supply of goods to preserve a small group of people in the wake of a series of world-wide disasters that have destroyed most human life. An essential (though somewhat odd) plot element is that the Builders elected to keep most knowledge of human history and technology from the people of Ember, providing them with just what is needed to survive, plus a concealed set of "egress instructions" which of course are lost. I won't give away the plot, but the fact that there is a sequel suggests that the young people do finally save the day. There's no direct space connection here, except that this isolated and self-sufficient (until the generator fails) community of some 500 people living in a fairly small place made me think of the problems that future groups of Mars or other space colonists will face. The sequel explores the nature of conflict and the problems of resource allocation and social responsibility in difficult situations. It's light reading, but thought provoking too. Tonight I happened to buy my first-ever copy of the British astronomy magazine BBC Sky at Night (November 2005 issue), in part to get the CD-ROM "coverdisc" that came with it. 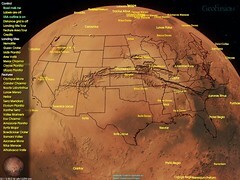 One of the bonus features on the CD was a copy of GeoPlayer Mars, a visualization and exploration tool by GeoFusion, Inc. Although it's only a demo version, it's got some pretty amazing features to help you learn your way around Mars (an expanded commercial version is apparently planned but not yet available). Getting it on a BBC CD was a nice piece of serendipity here in Massachusetts, but you can also get it as a 33 MB download from GeoFusion's web site. Note that this has nothing to do with Orbiter. Orbiter's hi-res Mars textures are pretty nice, but Orbiter is more suitable for orbiting and landing than for general sight seeing. GeoPlayer Mars is fantastic for this. Press H for a pop-up help list. Just before the holiday rush, I finished This New Ocean, William Burrows' wonderful history of "the first Space Age." Although I have followed space flight developments since my childhood in the sixties, this book really put it all together for me, and the scope and depth of what was accomplished between 1957 and 1998, presented in this integrated fashion, is truly breathtaking. I am struck by many things, and I'll just mention a few off the top of my head. The genius, persistence, and bravery of the Soviet/Russian space pioneers, cosmonauts, and everyday engineers - from Tsiolkovsky to the Mir Space Station, they accomplished things that should have been impossible within their creaky system (though not the Moon). Their real accomplishments were long hidden or distorted by Soviet secrecy and Cold War rhetoric. It's quite a story. The fact that so much was accomplished in terms of peaceful progress in space, as well as a lot of fantastic science, in such a short time, and all from programs that were fundamentally proxies for war. The brilliance and audacity of the deep space mission designers of JPL and other NASA labs. I could continue the series of posts tying various milestones of the Space Age to the wide range of available historical Orbiter add-ons, but I've decided to do a paper or presentation on that instead, a brief history of rocketry and space exploration, dynamically illustrated with Orbiter (yet another TBD, soon I hope). I will make one last connection -- to JPL's Voyager "Grand Tour," a program that barely survived the political turf and budget battles of the 1970's. But survive it did, serving as humanity's eyes and ears in our first truly close-up look at the outer reaches of the Solar System (Jupiter, Saturn, Uranus, Neptune, and many of their moons). This was truly a magnificent accomplishment. 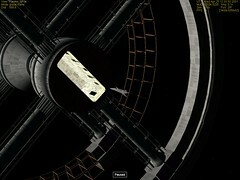 The graphics (more on Flickr) are from a Voyager add-on available at Orbit Hangar. Note: Actually I combined a couple of add-ons here. Jim Williams' add-on includes enhanced textures and configuration files for the four Galilean moons as well as a Grand Tour scenario (.scn) file which assumes another, older Voyager model. 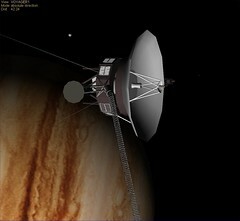 There is a better version of the Voyager spacecraft mesh by John Graves available here, so I also installed this add-on, then edited Jim's .scn file to change the string VOYAGER3 to VOYAGER1 (two occurrences) to use the more realistic Voyager mesh. We had some family visiting for the holidays, including a nephew with whom I had not talked for some time. He's a high school senior, a very bright young man who is applying to some good schools to continue his education. His goal: to be a lawyer. I asked him how he had done in science and math in high school, and he told me he had done very well, and that in fact math was his favorite subject. So I asked if he had ever considered a technical career in science or engineering. He said he had thought about it, but decided that law was what he would really like to do. This connected with an article I happened to read in the December issue of Reader's Digest, "America's Brain Drain Crisis." Nothing totally new here, but it was a succinct summary of the issues and a sobering reminder of the fact that technical education in the United States is a highly critical problem that is receiving little real attention. For example, less than 6% of current high school seniors plans to pursue an engineering degree, down from 36% a decade ago (although that figure sounds high to me). And we are also reminded that American students do very poorly in testing on math and science compared to much of the rest of the world. It's not surprising that students are often not inspired by the teaching of these subjects in schools - 38% of math teachers and 28% of science teachers in grades 7-12 lack a college major or minor in their subject area. And of course we hear again and again that other nations are emphasizing technical subjects in their educational programs, especially in Asia. The article ends with some hopeful notes on what can be done to improve this situation, including recent recommendations to Congress from the National Academy of Science, summarized here. I hope some of these recommendations are adopted soon. Under current conditions, I have to admit that my nephew's plan to pursue a law career makes a lot of personal sense - the outlook for lawyers in the US looks a lot more promising than that of scientists or engineers, alas. Maybe he'll change his mind, though it's not his job to solve such "big picture" problems for the nation. But I believe this is a job for those of us who are technical professionals and who are aware of and concerned about these problems. We need to contribute whatever we can to solving them. Francis Drake has created another great add-on for Orbiter, his third generation version of NASA’s proposed Crew Exploration Vehicle (CEV). 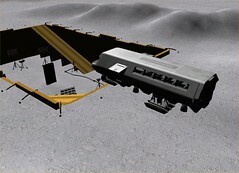 This one is based on the latest NASA ESAS descriptions and visualization graphics, with an Apollo-like command/resource module, and a “super-LM” lunar lander, called the LSAM (lunar surface access module) or informally the CEV-LM. 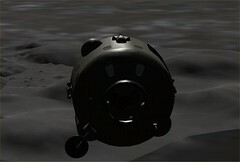 Since this model has hover engines, the Land MFD autopilot add-on by “LazyD” does a great job of landing it on the Moon. 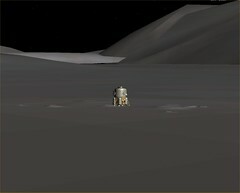 I decided to make the approach and the pictures a little more interesting by landing at Apollo 17’s rugged Taurus-Littrow site (using a nice add-on for this by “jtiberius” - search for tauruslittrow.zip at avsim.com). But this required a little experimentation and scenario tweaking since you need a starting orbit that passes very close to the landing site. The easy thing is to just take the Brighton Beach landing scenario, accelerate time by 1000-10,000 times, and wait for the orbit path to pass over the desired target. This works fine, but it took two weeks of “real time,” and guess what happens in two weeks on the Moon? It rotates and daylight sites get dark! The Land MFD doesn’t care, but I’m sure the astronauts would. Simply turning back the scenario date doesn’t work because Orbiter knows how the Moon and Sun move, and your track no longer passes over the target. Time for another approach, in this case a very handy utility written by Trevor John, Orbit Calculator 2.0 – not an add-on, but a cool standalone utility. It allows you to specify the body (Moon in this case) and the desired orbit parameters (date/time, periapsis and apoapsis altitudes, and latitude/longitude offsets – also retrograde or “westward” orbit in this case). I specified a 30 x 150 km orbit with latitude offset of -20.19°. I grabbed the RPOS and RVEL cordinates for the calculated apoapsis (high point of orbit) and pasted those into the provided Brighton Beach landing scenario file, replacing the existing values. I got lucky, because this passed directly over Taurus-Littrow (lat. 20.19° N) on the first try (I assumed I would have to experiment with longitude offsets as well). I fired up Orbiter with the Land MFD, and it made a perfect landing. This “alpha” version doesn’t yet have a separate ascent stage (it's a basic configuration-file vehicle, no custom DLL), so you can’t launch from the Moon and dock with the CEV-CM yet. But it’s a pretty amazing work in progress! More pix at Flickr. I just saw this in the latest email from KurzweilAI.net - space spiders! The idea is to have small "spider" robots construct large structures such as solar power arrays by crawling over a flexible web-like substrate deployed in space without the use of a conventional (large and heavy) rigid framework. A sub-orbital test of the concept will launch January 18 in Japan. The "Furoshiki satellite" is a joint project with NASDA, ESA, Vienna University of Technology, and Kobe University. Such large structures could be used for solar power satellites, antennas, and other things. I'm really enjoying This New Ocean by William Burrows. With about 100 pages to go, I've learned a lot that I didn't know about the Soviet/Russian space programs, their strengths and weaknesses, and the many mistakes and failures (often hidden until after the Cold War) that accompanied their successes. The greatest feat of human exploration to that time had been undertaken for exactly the wrong reason. Yet it remained the greatest human adventure; the Odyssey of the millennium. I have some more book observations and Orbiter add-on connections to add in the next few days, related to the early Soviet manned spacecraft and the robot explorers that visited the Moon, Venus, Mars, and eventually Jupiter and beyond. But jet lag rules for now (just back from India, your basic 24 hour travel day). It was 102 years ago today, just a short flight, but it got the whole flying thing started. 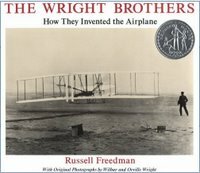 The Wrights were geniuses of practical engineering, and what they accomplished in a few years of systematic and persistent study and experimentation is simply amazing. Their business sense did not quite match their engineering ability, and they subsequently spent a lot of time and effort trying to protect their key ideas legally while their competition simply took them as a starting point and ran with them. 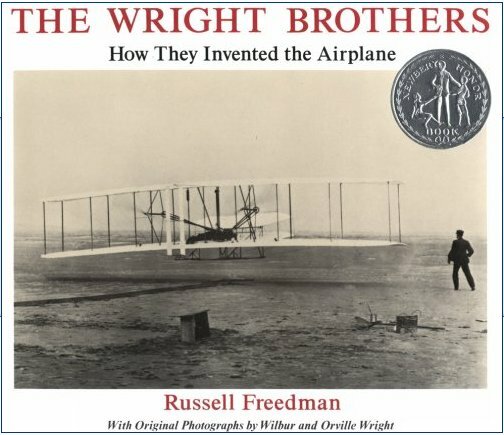 My favorite Wright Brothers book (pictured) happens to be a book for young readers, but it's really a great piece of writing and it has wonderful illustrations. It's a quick read that really lets you appreciate the scope of their accomplishment as well as their humanity, with enough details to make them come alive. P.S. I just noticed that Mark Paton has an Orbiter add-on for the Wright Flyer and Kill Devil Hill, the site of the first flight! Mark has actually created a wide range of historic and/or unusual add-ons for Orbiter, as you can see in an author search for Paton on Orbithangar.com. Robert Goddard launched the first liquid-fuel rocket from his Aunt Effie Ward's farm in Auburn, Massachusetts on March 16, 1926. This is just south of Worcester, not far from where I live. The field has long been a golf course, and there are markers there indicating the historic launch location. I've visited the small Goddard Memorial Park in Auburn, but not the launch site itself. This third post of the day was prompted by the re-discovery of Mark Paton's "Early Rockets" add-on for Orbiter. I had it all along, but I was searching for a file called "Goddard" something, and Mark's add-on covers the very early German and Russian rockets as well as six of Goddard's designs (hence the name "early rockets"). There's a great PDF manual (lots of historic background and diagrams) and a number of scenarios. So I decided to do some quick flight testing at Ward Farm Spaceport, using the Flight Data Module that comes with Orbiter (activate it in the module tab of the Launch Pad dialog, then open it with Control-F4 or from the Orbiter menu). 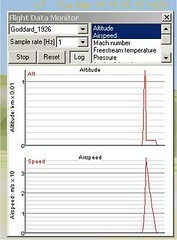 This creates a little window where graphs of your selected flight data are displayed (and can be logged to a text file). I chose altitude and airspeed, and I used the Map MFD to get the flight distance by setting "Ward Farm Spaceport" as my target base. Following the suggested procedure (in scenario comments), my results were close to Goddard's, about 12 m altitude, and about 60 m down range distance, flight time about 3 seconds. Hey, the Wrights didn't go far on their first flight either. I like airplane models. When I was a kid, I was obsessed with them, and I built dozens from plastic kits, starting when I was maybe 9 years old. Most of them were military aircraft, and mainly jets, since I wanted to be an Air Force pilot. I still remember my excitement when I saved the money to get a 1/72 scale model of the B-52 (I think it was a Monogram model, though I recall that I generally preferred Revell kits). That thing was huge! The B-52’s wingspan was 185 feet, or 31 inches for the model. I remember building a few large scale models too, a 1/32 scale Huey Cobra comes to mind. I may have built some WW2 planes in 1/32 also, but I think most of my models were 1/72 or 1/48. I was a fairly careful modeler, concerned with correct paint schemes and decal markings, but I wasn’t a custom modeler, and I think my assembly quality was only fair. I really wanted to see the completed model, so I probably rushed the building process many times. I would occasionally dabble in non-aircraft models. I built a few modern ships, especially aircraft carriers and submarines. Of course there were some spacecraft too. I remember building the Apollo CSM and LM, and also the Gemini spacecraft (that may have been large scale). I never built cars – heck, you could see real cars every day! Except for James Bond’s Aston-Martin DB5 (with various secret agent mods). That was a special case. I think part of Orbiter’s appeal for me is related to this nostalgic love of models. The models in Orbiter are virtual, but the 3D graphics quality gives you a really good feel for what they are like, and some add-on developers do an amazingly detailed job. Plus you can fly these models – and not just by zooming them around making airplane noises. As far as physical models, I just don’t have the time to build them any more, but I have bought a few 1/72 die cast models for old time’s sake. 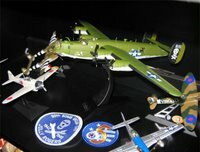 The picture shows a few of the WW2 models, including a 90th Bomb Group B-24 (my father-in-law was a pilot in that unit in New Guinea in 1942-43, before they were called the "Jolly Rogers," read the story here). And yes, I still sometimes zoom them around and make airplane noises. But Dyna-Soar, like its namesakes, was destined for extinction. In chapter 7 of Burrows’ book, we start in 1958, in which there were five successful US satellite launches, establishing that low Earth orbit could be reached with some predictability. This was also the year that NASA was created to centralize US space efforts. It was built from the existing NACA with the addition of Von Braun’s Huntsville rocket development center and JPL, both transferred under duress (Ike’s orders) from the Army. Some space development efforts remained under military control (such as the first satellite reconnaissance program, later called Corona). But even here, there were turf battles between the Air Force and the CIA over who would control the “spy satellites” that would begin to return useful imagery in August 1960, an amazingly short 30 months after Explorer 1. The Air Force was also very excited over the prospect of space as a new battlefield, a new “high ground” that must be captured with manned spacecraft before the Soviets could do so. Exactly what this meant was never really clear, even to the Air Force planners who insisted on its necessity. ICBM’s were already assigned to the Air Force, but they meant to also have manned space fighters, recon craft, and bombers, and they would figure out what to do with them later. So they started planning for them. 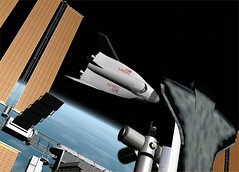 The development vehicle was a proposed space plane, first called Dyna-Soar, and later the X-20. To be boosted into orbit atop an “expendable” Titan booster, Dyna-Soar would carry a single pilot who would perform various missions in orbit, then re-enter the atmosphere and land like an airplane (a glider actually). The designs and artists’ impressions look cool, but for various reasons, Dyna-Soar never made it to space. But it did make it to Orbiter! Thanks to a terrific add-on by Erik “Sputnik” Anderson and “Burncycle,” you can fly the Dyna-Soar into its planned polar orbit (this requires a separate add-on, the CVEL Titan), and if you’re good, you can even re-enter and land. As usual for Sputnik, the quality of this add-on is excellent, as is the included PDF manual for it. More pictures at Flickr. Beep. Beep. Beep. That was the sound that kick-started the Space Age on October 4, 1957 (my Mom's 25th birthday - I was four). 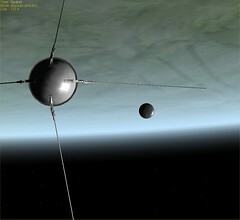 Of course that was the radio signal from Sputnik 1, the first man-made satellite, launched that day by the Soviet Union. 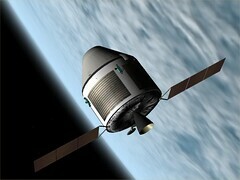 Trying to quickly catch up, the US attempted to launch the Navy's Vanguard satellite on December 6, 1957. It spectacularly and publicly blew up on the pad, earning it the nickname "Kaputnik," among many others. But on January 31, 1958, the US successfully launched the small JPL-built Explorer 1 into orbit, using the Army's Redstone-derived Juno booster (the launch was not announced ahead of time). Redstone in turn had been developed by Wernher von Braun and his Army rocket development team from the German V-2, a number of which had been captured at the end of WW2 and used to accelerate the Army's rocket development programs. Explorer 1 was small and simple, but it did more than beep - data from its cosmic ray particle detector led to the discovery of the Van Allen radiation belts, a very significant scientific accomplishment for America's first satellite. Of course the Soviets were doing science in space too - Sputnik 2 (November 1957) carried several scientific experiments as well as Laika the dog. Laika adapted well to space, but there was no provision for controlled re-entry on this flight. After a week of monitoring her vital signs by telemetry, she was given a remote-controlled lethal injection. Of course you know all this, and so do I, but now I know it even better thanks to several well-written and detail-rich early history chapters I've just read in This New Ocean by William Burrows. I've left out the historical and political context here, though this is important and is a major strong point of this book. While there are many technical details and a fair number of pictures in the book, reading about these "early bird specials" made me want to see them and launch them for myself in Orbiter. So I installed a few add-ons, V-2/Bumper by Robert Conley and Brian Sikemma; Sputnik by Manuel Amorim; Explorer 1 by Jim Williams; and a version of Vanguard 1 announced recently by Dave413 on the Orbiter forum, and supplied by him with actual current Vanguard orbital elements. Current? Yes, Vanguard 1 finally made it to orbit in 1958, and it remains in orbit today, the oldest man-made object still in space. Orbiter pix show Sputnik in Orbit and Explorer 1 climbing out above Florida (see more on Flickr). No background web links in this post since I am writing "off line" - my only web access at this conference in India is a shared "cyber cafe" which is in heavy demand and seems to go down every few minutes. So I gotta be quick! Jet-lagged rambling from a Lufthansa lounge at Frankfurt - a brief reprieve before the expected India web blackout this week. The Boston snowstorm was a real nightmare - crazy ride to the airport, many canceled flights - but mine was only late. De-icing took about 45 minutes, but you don't want to mess with the shape of those 747 airfoils, so I say take all the time you need and get all the snow and ice off. It was originally an 8 hour layover for the Delhi flight, so even though we were hours late, I still have a few hours to kill. I just started reading This New Ocean, "pre-history" stuff so far. It's amazing how much Tsiolkovsky got right in his technical predictions of space flight (writing in the late 19th and very early 20th century). It's also amazing how closely his vision of the human future in space matches the vision (if not yet the reality) still held by many modern space advocates (including me, more or less). He was a true visionary. On another note, Francis Drake is continuing his series of CEV models for Orbiter with an alpha release (announced on Orbiter forum) of the Apollo-like CEV that has appeared in recent NASA concept art. I installed it to have a quick look, and it looks pretty good (sample above, "first mission to ISS in 2014" - more views on Flickr). I also read a good article about t/Space in the new Air & Space magazine, and I hope their CEV-alternate (CXV) works out, gets more funding, and is able to start visiting the ISS before 2014! And if not them, then someone else. I know time flies, but 2014 just seems so far away. That last one is a nanotechnology classic, Feynman's "Plenty of Room at the Bottom" talk. More distractions! Why does Amazon keep sending me stuff? Just because I ordered it? 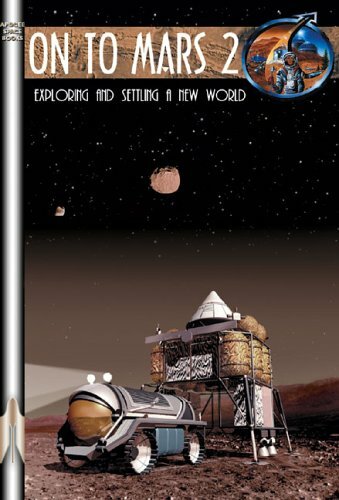 Just arrived: On To Mars 2: Exploring and Settling a New World, which includes 46 printed papers from the Mars Society conferences from 2002 to 2004, plus a CD-ROM with many additional papers in PDF form, as well as a 34 minute MPG movie. Just glancing through it, it's impressive to see the range of subjects, including a number of papers based on simulated Mars exploration research at the Mars Society desert and arctic research stations. I won't be able to take the book to India, but the CD won't add much weight. I'm really hoping to attend the Mars Society 2006 conference in Washington, DC next August (it will be my first). No time for Orbiter or other fun stuff these last few days - mostly getting ready for my India trip on Friday (yikes, that's tomorrow). But following up on my "must read" post the other day (essay by physicist and SF writer Dr. Gregory Benford), the web site he has set up with Dr. Michael Rose is an oasis of clear thinking and rational expression about what is going on in the world and where it is leading. I have to explore this site further when I get back from India, but this introduction to "the new future" gave me a real Keanu Reaves moment (a very, very heavy "whoa"). It feels right and scary and reassuring at the same time. It says provocative things that need to be said, and I want to read more. I also like this December 6 "interactive dialog" blogging piece on the rise of fantasy (which now dominates the market that is called "fantasy and science fiction"). This is more than just changing tastes - it's a retreat from thinking about the future. Thought-provoking stuff. Actually it's a LibraryThing - thanks and curses (mostly thanks) to Anthony Kendall for turning me on to this web site, the booklover's equivalent of crack (wait, I thought that was Amazon - OK, now there's two kinds). It's a place to easily create a database of books, either public or private, and free for up to 200 books. Since I spent about 90 minutes between last night and this morning and entered 158 books without breaking a sweat, I figured I should support the developer and become a $25 lifetime member. As I mentioned in an early post about obsession, every obsession phase (flying, songwriting, physics, optics, Japanese, space, whatever) has been accompanied by books. Since I rarely get rid of a book, that means there are quite a few around my house and office. I don't know how many, but maybe a couple of thousand. I have occasionally started to catalog them myself, but it's a slow job if you have to type or write down much information yourself. So I quickly lose interest (another problem is that if I open a book to grab information, there's a good chance I will get stuck reading it). But LibraryThing is really easy and fast to use because it is linked to book databases at Amazon.com, the Library of Congress, and other sources of book information. So you don't have to enter much information to find and enter a book into your catalog. An even faster way is to find someone else who has a public catalog with some books in common with you (they tell you who these people are). Chances are he or she has others that you have. You can view galleries of book covers and when you see one you have, just click and select "add to mine." You can import and export catalog data; display books in various formats; add ratings, comments, or reviews; and probably a lot of other stuff. Way cool. My embryonic catalog is public if you want to take a look (go to LibraryThing.com, search for user FlyingSinger). Well, I have my India trip book (one of them anyway). This New Ocean, "the story of the first space age," by William Burrows is not a new book (published in 1998), but it looks like a great read. I bought a used copy through Amazon.com (I love buying used books through Amazon - unfortunately I also love buying new books through Amazon). This comprehensive history of rocketry and space flight is a pretty fat trade paperback, but it should still fit in my computer bag for the long trip from Boston to Dehradun, India this Friday to Sunday (that's just the trip over - I'll be there until the 18th). I'm going to attend an optics conference. Although I have often been to other Asian countries, this is my first time to India. I don't quite know what to expect but it should be interesting in any case. One of the strangest things will be the likelihood of no internet for more than a week - seems the hotel and conference don't have net access. It's been a while since that has happened - so in addition to the booster shots and anti-malaria pills I already received, maybe I should ask my doctor for something in case of blog withdrawal symptoms. Centauri Dreams is a blog I visit often. It's always interesting, but today there is something extra special there, a guest essay by Dr. Gregory Benford, "Columbus or Erikson?" The subject is the expansion of human horizons, but I won't attempt to further summarize this eloquent piece of writing. As usual, Monday brings a new batch of excellent articles at The Space Review. 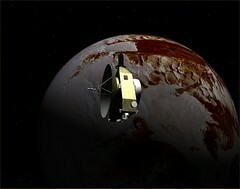 One of them is a report by Alan Stern on the New Horizons mission that NASA will launch next month to explore Pluto, its moon Charon, and the Kuiper Belt, a mission which will complete the initial exploration of the solar system. Alan Stern is a planetary scientist and the Principal Investigator of NASA’s New Horizons mission, and he provides an excellent overview of the mission and its goals, and some thoughts on its historical significance. As is often the case, Orbiter add-on developers are ahead of the curve on historic missions, and New Horizons is no exception. Hans Castorp has released a very nice model of the New Horizons spacecraft, including scenarios for several phases of the mission. To use this add-on, you will need parts of several others (defined in the readme file), in particular the Pluto-Charon 2.0 add-on by Sean Evans. Orbiter's solar system does not include Pluto by default (be sure to read the readme file for this and to edit sol.cfg in the /Config folder to add Pluto and Charon - just installing the files won't do it). More pictures on Flickr. 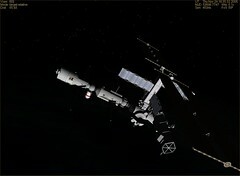 Just by chance today, I stumbled on two different space station simulations, ShortHike and SpaceStationSim (SSS). I haven't played with these myself, too busy right now (they are both commercial programs with demos available). But in the spirit of "let a thousand space programs bloom" - space related simulations that emphasize different aspects of space can only help by getting more people interested - I decided to write about them now. Since I haven't played with them, I'll keep it short. All I can say from the web sites is that both have good-looking graphics and support space station building (ShortHike is more general, allowing you to build large and complex stations, while SSS is more about the ISS). SSS seems to have a lot of crew management features and looks very much like "The Sims in Space." The graphic above is linked from ShortHike's on-line tour. If you have an interest in space but the orbital mechanics side isn't your cup of tea, maybe you'll enjoy one of these sims. Greg Burch has created some amazing Orbiter add-ons, most of which focus on late-21st century possibilities for space planes and space stations. His 3D modeling is really superb. 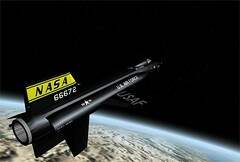 But in September he released a historical add-on (working with Scott Conklin), the X-15 Project. It's a real beauty. This is an example of a single add-on for Orbiter that could practically be a separate flight-sim product (if it didn't happen to be a free add-on for a free space flight simulator). Greg and Scott implemented four variations of the X-15, and obviously devoted a lot of time to flight modeling in addition to graphics modeling. The package includes the B-52 that launched the X-15 and a PDF "flight manual" that graphically simulates the 1950's era manual for the real thing. Talk about attention to detail. Yes, 1950's is right - the Orbiter add-on was released very close to the 50th anniversary of North American Aviation receiving the contract to develop the X-15 (September 1955). With the later XLR-99 rocket engine, the X-15 set an altitude record of 107.96 km (354,200 feet) on August 22, 1963, well above the 100 km "edge of space." Playing with the add-on tonight, I made it to 113.2 km, but I neglected to save 5% of my fuel for the RCS controls on re-entry. 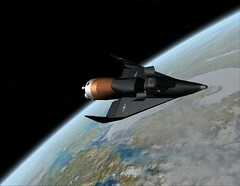 The real X-15 had a separate fuel supply for the RCS thrusters, but the Orbiter one doesn't. Oops. I found an interesting article by Jerry Pournelle, "How To Get To Space." It makes some good points about past U.S. government X programs (X-1 to X-15 - more recent X programs have had X names but were run differently and less successfully) which were very successful in part because they set limited goals and short time frames, had relatively small budgets, and were relatively invisible (if not secret, especially the early ones), which allowed for programs to continue even when there were failures, as there generally will be when you are "pushing the envelope." Jerry proposes that a similar approach be taken for getting to space, specifically a SSTO development program that starts with suborbital flights. Whether or not this specific approach will fly, I like the major point that he makes that "a space ship is a vehicle" - it's not ammunition. Vehicles should be easily reusable (not simply "rebuildable" as he describes the Space Shuttle) and this is the key to eventual low-cost operations (e.g., cost per kg to LEO a relatively small multiple of fuel cost, as is the case for modern long-distance airline travel). This is also very much the theme of The Rocket Company, which I will finish reading this weekend. 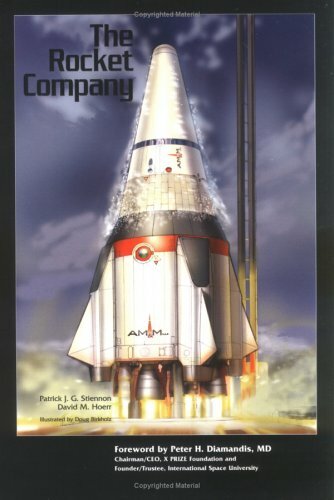 This book collects and proposes a great many good ideas and puts them in the context of a fictional private launch vehicle development project (two-stage, fully reusable). It makes a lot of sense, and I think it should be read by anyone who wants to get into the space business at any level - not that I know a lot about this personally, but until one of the real private space ventures achieves substantial success and someone writes a case study of how it was done (and probably even after that), this is definitely worth a read. Well it ain't pretty, and it's primitive, but it's mine. Just to see how it's done, I created my own "spacecraft" for Orbiter. I call it the Uglybug. It's a limited edition - this will be the only picture ever shown! I also have renewed respect for modelers and add-on makers who make things they want to make and make them look a lot like a real spacecraft (this was sort of random). I'm sure with practice I can get better, but this was just a 2-3 hour exercise with software I never used before, and it served its purpose. Thanks to Harmsway whose basic "UFO" tutorial got me started. Anim8or is a freeware 3D modeling tool that's pretty flexible and easy to learn but is rather different from my previous 3D CAD experience - as usual, letting go of assumptions, reading some of the documentation, and experimenting can go a long way. I exported the mesh to a 3ds file and used 3ds2msh (one of several mesh conversion utilities) to convert to Orbiter's special .msh format - this got me a silvery gray "ship"
Finally I grabbed one of Vinka's examples for his spacecraft.dll (which allows use of exhaust textures, animations, and other cool things without programming), and I modified its .ini file to work with my mesh (no animations yet, but it's a start). The basic steps of making a spacecraft for Orbiter are not as hard as I thought they would be, but making something polished and complex will clearly take more time and work. "Sputnik" (Erik Anderson) continues to produce an amazing stream of high-quality add-ons for Orbiter. A search of OrbitHanger.com shows 16 add-ons by Sputnik, and I'm sure there are more. They include a number of historically proposed spacecraft that never flew, such as the X-20 DynaSoar, the amazing "World of Colliers" add-on, and the even more amazing "World of 2001" released recently (I've written about several of these in the last few weeks). Today he released another one, the HL-20 Personal Launch System/Crew Emergency Rescue Vehicle, a small lifting-body space plane intended to transport up to 10 passengers to the ISS. This NASA Langley design was recently resurrected by SpaceDev as the basis of their proposed private-development DreamChaser vehicle. I wrote about this on November 21, saying there was not an Orbiter add-on yet. Thanks to Sputnik, now there is (more or less). It's a fun little ride. Actually it's been a free download and the first song on my CD since 2003, so why now? Well, it is "music" of the spheres, and sometimes I still think about my music and wish I could restart my periodic songwriting obsession (but it happens when it happens). I got a new MP3 player I was trying in the car this morning. I had a couple of my own songs in there, and "Just Dancing" came up in shuffle play. I hadn't heard it for a while, and I thought it sounded pretty good (modestly speaking, of course - I wrote it, played acoustic guitar, and sang most of the parts myself - acoustic pop/rock with a bit of Beach Boys inspiration). But judge for yourself (some people call this "the pink sweater song," hence the picture). Listen or get your free download here. But who will actually do it? I read an article in the November 14 Economist called "Israel: Punching Above Its Weight," which discussed the fact that Israeli high tech businesses are successful in the world far out of proportion to Israel's size. Part of this is attributed to a high percentage of engineers in the work force. Out of 10,000 employees, Israel has 135 engineers, compared to 70 for the US, 65 for Japan, and 28 for Britain. We need more, and more inspiring, science and math teachers in the US. We need ways to help students get excited about science and math and to want to do these things as careers. Space is important, as are energy, environment, biotechnology, and many other technical fields. I'm not saying the sky is falling, but I am concerned not only for space development but for other things that require science and math - who will actually do this stuff? I am all for international efforts, and if the next human to walk on the Moon is Chinese, that in itself is OK with me (although there may be wider implications to this, I know). But the US has always been a leader, and I like to think a force for good (at least sometimes), and I wonder if we can continue to be if these trends continue. If you are reading this, and feel discouraged by an inability to communicate to others your own feelings about the importance of an active space development effort, comfort yourself with this thought. If you want to be on the leading edge of anything, you have by definition to be a couple of standard deviations away from most people. That makes you an odd-ball. The trick is to learn to accept it, then to like it--and keep on making lots of noise for what you believe in. I wanted to chime in on Sam Dinkin's Space Review essay "The High Road" and add my voice to the sentiment that space is too important for advocates to be divided over petty differences. I also wanted to second a motion by Anthony Kendall that we speak out to people about the importance of space, even to those who may be most indifferent and our harshest critics (yes, our families and friends - just kidding - sort of). I went looking for a quote to support this sentiment, figuring I'd use something by Carl Sagan or Arthur C. Clarke, and I found a whole page of great space quotes by these and others. The "party line" is certainly presented eloquently by those collected there. But I finally selected the quote above - perhaps less famous than some others on that page, but more relevant to the issues of fighting the good fight, cooperating with those who share your goals but maybe not your agenda, and making a contribution, however small, to something important. So here's to fellow space advocates and odd-balls, to future Mars colonists, and to all mankind. Lots of real work and a new book have diverted me temporarily from Orbiter and blogging. N.B. Two chapters (1 and 4) from the book are still available on line at HobbySpace.com, where work-in-progress portions of the book had originally been posted. Orbiter users quite often post really cool stuff in the forums, news of new add-ons, rumors of new releases, and sometimes a connection with real-world spaceflight. Recently "David413" posted a new add-on model of the ISS (International Space Station) in its current form (the default ISS in Orbiter is the future completed version). He included in this zip file three scenarios with up-to-date ISS orbital elements for November 24, 25, and 26 (the last few days) when the ISS was in one of its periodic "constant sunshine" states (when the positions of the ISS, the Earth, and the Sun result in the Sun being visible from the ISS at all times for several days, even when it is above areas of the Earth that are in darkness). I installed the "new" ISS and ran the sunshine scenarios, and I also installed Radu Poenaru's "extended Map MFD" for the occasion (available at www.avsim.com, file mapmfd.zip). 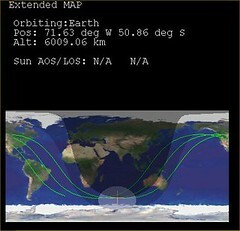 This add-on MFD shows multiple orbits as well as the sunlit areas of the Earth on an enhanced color map. In the pictures shown, you can see that at 1835 UT on November 24, the ISS was over the south Indian Ocean and was fully illuminated by the Sun. The MFD shows that the Indian Ocean region itself was in darkness. Pretty cool - orbital mechanics works! Note that getting accurate ISS positions like this requires creating a scenario with updated orbital elements available from NASA. Harmsway explains how to do this here. The ISS elements are not automatically updated by Orbiter (which means that the position of the ISS in Orbiter does not closely match the real ISS by default). Thanks to Anthony Kendall, who referred me to to Technorati.com, I registered my blog there and thereby found at least one other blogger who shares my interest in Orbiter. Citing my recent Orbiter review and this blog, Spaceflight Sandbox wrote about some Orbiter experiences on November 15. Exploring further, I found an October 9 post titled "Why Space?" which offers some good ideas for how to answer (and how not to answer) this question when it is asked by someone from outside the Space Faithful. There have been many famous and subsequently embarrassing impossibility statements in the past, including Lord Kelvin’s 1895 statement that “heavier-than-air flying machines are impossible” (he also predicted in 1897 that “radio has no future”), and the New York Times’ famous 1920 criticism of Robert Goddard and his rocketry experiments, which claimed as obvious that rockets could never operate outside the atmosphere as Goddard proposed, since the vacuum of space would give them nothing to push against! The Times published a “retraction” in 1969, the day after Apollo 11 landed on the Moon. People who are aware of statements like this (and there are plenty more, this page collects many of them) tend to be wary of making technological impossibility statements, or at least to put them in more qualified terms, based on what is possible today, or at a reasonable cost, or within the known laws of physics, “possible but highly unlikely,” etc. Some examples of such “qualified impossibility” statements (related to human colonization of Mars) can be found in a recent opinion piece on SpaceDaily.com. Anthony Kendall made some really good points about this in his blog. Space advocates may sometimes need to be reminded of important realities, but we should try to not assassinate the messengers or their dreams in the process. I think space is too important to exclude anyone who is supportive of the goals, even if they are not rocket scientists. Among the many Orbiter support and "fan" web sites, the Orbiter section of Harmsway's eHarm.net web site is probably the winner for the one Orbiter support site you would take to a desert island (OK, a ridiculous analogy, desert islands usually have broadband anyway). But Gene Harm really has put togther an extensive array of Orbiter support materials, with an FAQ, a number of tutorials, missions/adventures, screen shots, and more. His "Space Shuttle Guide" is a brief but up-to-date introduction to installing and flying the latest Space Shuttle add-ons for Orbiter. There's also a very useful overview of the Apollo/NASSP add-ons. This site has really helped me to explore and understand Orbiter, and I highly recommend it. Just after sunset today, the sky was clear, and Venus was incredibly bright - I thought I was seeing landing lights for a business jet climbing out of Worcester Airport. Mars was already quite bright too. I've read and thought a lot about colonizing Mars, but until I saw a reference to this NASA paper by Geoffrey A. Landis in a post on the Orbiter "real space" forum, I would have thought that colonizing Venus would be impossible without massive terraforming to modify its atmosphere (Carl Sagan suggested seeding the clouds of Venus with genetically modified algae to remove CO2 and eventually reduce the severe greenhouse effect). In Landis' paper, the idea is to avoid the brutal surface temperature and pressure by setting up floating cities in the clouds, about 50 km above the surface, where the atmospheric pressure and temperature are about Earth standard, and gravity is about 0.9 G. This is not something we could do next week, but the paper suggests that it would be physically possible and would offer some interesting advantages. The picture is an Orbiter shot of Venus just after sunrise. I'm getting back to my CEV "Back to the Moon" practice mission, setting some things up to simulate NASA's planned mission profile. As I understand it, a heavy-lift launcher places the unmanned LSAM (lunar surface access module) along with a "departure stage" for TLI (trans-lunar injection, pretty much using the old Apollo terms) in a parking Earth orbit. 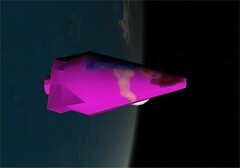 The manned CEV is launched separately, and it soon docks with the LSAM in Earth orbit. At the right time, the CEV/LSAM/departure stage stack makes the burn for the Moon. There's more, but from here on, it pretty much follows the old Apollo Moon landing plan. I'm using Francis Drake's "old" CEV add-on, which doesn't have the very latest projected CEV shape but is quite cool. Good things: I docked the CEV with the LSAM in LEO (don't we love our TLA's! OK, one FLA). I installed a Taurus-Littrow 3D terrain "base" (by jtiberius) to have an interesting place to land (but didn't actually land there yet). I edited scenario files to put the LSAM at this base and practiced taking off for lunar orbit (the LSAM either floats about half a meter above or sinks a little into the 3D mesh for this terrain - not sure if this is fixable). Not-as-good: I couldn't run the edited scenario to dock the LSAM with the CEV-upper stage stack (not sure why). LSAM has the up-is-forward confusion of many tail-sitter spacecraft, so docking is tricky (both view and controls). Landing would be tricky too except for the Land MFD. No docking port frequencies so docking is all visual (no MFD help). Actually should have the LSAM on a different booster. A few minor problems but it pretty much works. This is all preparation for a full-up CEV/LSAM Earth-Moon mission soon. More things to figure out, but it's going OK. More pix on Flickr. The Hubble Space Telescope is perhaps the most famous space-based optical system, and several of my colleagues actually worked on the design and other aspects of the repair optics (the company even won a NASA award for this and other space-related work). In addition to the obvious imaging applications (e.g. 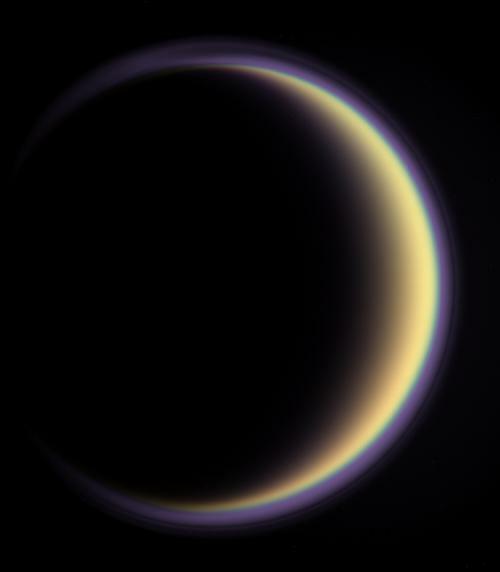 amazing Cassini and Spitzer IR images), optics are also involved in science instruments such as spectrometers and polarimeters that provide scientific data on the atmospheres and surfaces of planets, moons, and stars. 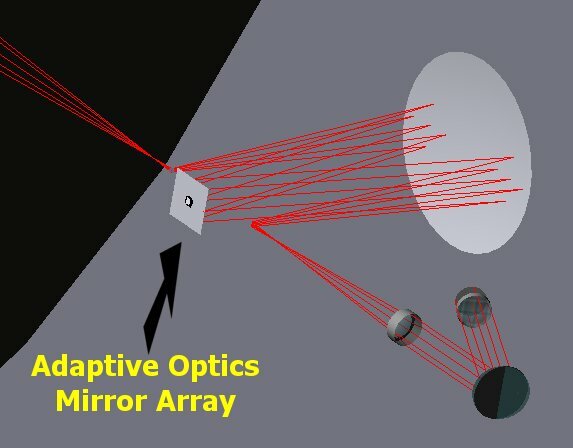 Adaptive optics are widely used in astronomy, laser communication, and other applications where the distortions of the atmosphere must by dynamically compensated. A future application could be the laser power beaming systems for the space elevator. And even carbon nanotubes have an optical side - a recent report indicates that under some conditions, single-walled carbon nanotubes can emit very bright and tunable (1-2 micrometer wavelengths) infrared light. After mentioning the Hitchhiker's Guide to the Galaxy in my last post and linking it to Wikipedia as I often do, I happened upon a link to another "wiki" which is called h2g2 (one of the several extant abbreviations of Douglas Adams' best-known title). This one is hosted by the BBC and purports to be "the unconventional Guide to Life, the Universe and Everything," with user posts on a variety of subjects. The difference from the rawther serious Wikipedia is what seems to be a certain humorous or sarcastic spin to many of the entries (based on quick visits to a few pages). See for example cockpit, flight simulators, and Obstacles to Manned Space Exploration: Part I - Propulsion (including the sub-section "solutions to getting it up"), and Exactly 100 things to do with a towel. I really like Wired magazine, and in the December 2005 issue, there's an essay by Bruce Sterling on the Dawn of the Carbon Age. I've been reading and writing a lot about space elevators, whose now-more-likely feasibility is based on the remarkable strength and light weight of carbon nanotubes (CNT). Sterling does mention space elevators in his essay, but suggests (gasp!) that a material strong and light enough to create carbon beanstalks into space might have a few other uses down here. Of course that's true, and the fact that there will be huge demand for CNT-based materials will help to make them cheaper, which will be a good thing when you need to buy a 100,000 km ribbon of the stuff for the elevator. Thus begins the Age of Carbon. Future readers of the Hitchhiker's Guide to the Galaxy will no doubt be advised to carry a roll of CNT duct tape in addition to the indispensible towel. Although it looks a bit like a cartoon spaceship, SpaceDev's lifting-body Dream Chaser is an intriguing alternative to capsule-style CEV spacecraft for "safe and affordable crew access to the International Space Station" and other missions. It also looks rather like the proposed (never built) European Hermes spaceplane. Note that the picture here is linked from the SpaceDev site - Dream Chaser is not in Orbiter quite yet (there is an Orbiter add-on version of the Hermes somewhere, but I can't find it online at the moment - OK, here is a lunar mission version!). Now just a few days later, SpaceDev also announces the results of a study that "Finds Lunar Missions Can Be Completed for Less Than $10 Billion." In the proposed SpaceDev architecture, each mission would position a habitat module in lunar orbit or on the surface, allowing the buildup of some reusable infrastructure for later use. There is also a wild looking lunar-landing rocket chair that looks like a souped-up ejection seat (I guess it more or less is!). An interesting week - SpaceX plans to launch their first Falcon 1 rocket this Friday. There's a lot going on in commercial space development. Will it all get funded? Will it all work? Probably not. But some of it will. Space is turning into a business with multiple paths and players. It's very dream-worthy in any case. Orbiter add-on builders, start your 3D modelers! There's a really cool 5-minute video by "Tinfish" that showcases some aspects of Orbiter in a rather artful way. "Stargazer"(26 MB wmv) uses scenes of the Moon, Earth, Jupiter, and some spacecraft, and has a soundtrack with some interesting audio clips. I have seen a few other Orbiter-based videos, but this one really highlights the visual beauty that greatly adds to Orbiter's appeal as a space flight simulator. Tinfish has previously made movies based on Microsoft Flight Simulator (more info here). This is his first using Orbiter, and I hope he makes more. A quote from "Green Mars"
And because we are alive, the universe must be said to be alive. We are its consciousness as well as our own. We rise out of the cosmos and we see its mesh of patterns, and it strikes us as beautiful. And that feeling is the most important thing in all the universe - its culmination, like the color of the flower at first bloom on a wet morning. It's a holy feeling, and our task in this world is to do everything we can to foster it. And one way to do that is to spread life everywhere. To aid it into existence where it was not before, as here on Mars. From Green Mars by Kim Stanley Robinson, spoken by the character Hiroko, page 9 of the US paperback edition. I've decided to start writing brief overviews of some of the many Orbiter-related web sites that are out there. Orbiter is freeware and has no official support, but between the forums, the add-on sites, and the web sites of many individual Orbiter users, the total available support is really quite extensive. John Dunn's Orbiter site is a case in point. 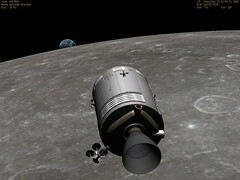 It focuses with incredible detail on flying Apollo missions using the NASSP add-on. It includes historical background on the real activities of each of the 17 phases of a full Apollo mission, followed by detailed instructions for the Orbiter procedures, including many screen shots and at least one video (lunar descent, stream or download). Although I have not yet done a complete Apollo mission myself (only selected parts), I have read through John's tutorial and used it as a reference to understand the "why" as well as the "how" of the many Apollo mission steps. It's quite an impressive document. 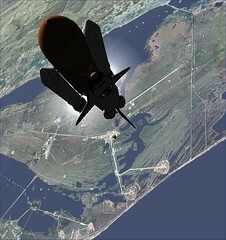 The tutorial dates from 2003 and thus is based on earlier versions of Orbiter and NASSP (Orbiter 030303 and NASSP4, while current versions are 050216 and NASSP 6.4.2), so there may be some changes in some details of how these missions are flown. 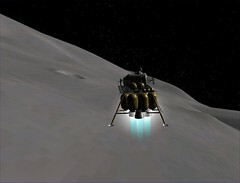 For example, the tutorial refers to the Lunar Landing MFD (LM autopilot), and I have only used the more recent Land MFD when I have done practice Moon landings, so I'm not sure if the earlier MFD is still supplied or still works with the latest NASSP. But I have not found a more detailed tutorial on flying Apollo in Orbiter, and I believe it's worth reading if only to gain an appreciation of the scope and detail of these missions. Speaking of impressive documents, John's site also includes a page with downloads of many official publications from the Apollo era, including the 56 MB PDF "NASA Apollo Command Module News Reference" from 1968. 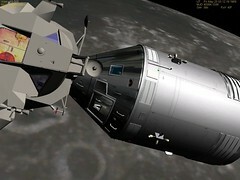 The picture is my own shot from a recent Apollo 10 flight - just some lunar orbit docking practice. But someday I will fly a complete Apollo mission, and John's tutorial is already in a three-ring binder ready to guide me through the zillion steps to the Moon and back. World of 2001 for Orbiter!!! Amazing new add-on just announced in the Orbiter Add-on Forum, World of 2001 (3.0) by Sputnik, Nautilus, and 80mileshigh. A complete rework for Orbiter 2005 with lots of new stuff. Amazing work! Dozens of scenarios, spacecraft, and bases from the classic movie "2001: A Space Odyssey." This was already my favorite family of SF-based add-ons, but the various parts had been built for earlier versions of Orbiter and sometimes caused problems. There is even an animated retracting dome at Clavius base. More pictures on Flickr. I'm glad I've retained a moderate level of French language skills for all the many years since high school. In France, it's good for a laugh and sometimes even for conversation. And my reading level is still quite good, so I can generally read anything that interests me. Case in point: brand-new issue of ESPACE Magazine that I picked up at the airport just before leaving Paris. This (#17) is a special edition with the theme "space exploration, the future in pictures." And the pictures are great - it's a large format glossy magazine with excellent full-color printing. 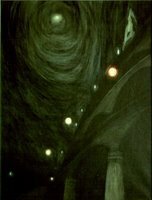 There are many paintings and photos, starting with Chesley Bonestell's wonderful space paintings of the 1950's (discussed in my October 25 post on the "World of Colliers" add-on for Orbiter), many NASA concept paintings (including examples by and an interview with artist Pat Rawlings), and much more. There are also interviews with American and French astronauts and space researchers. It's really cool. 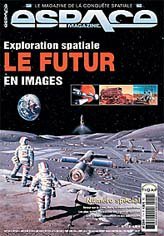 If you are a space enthusiast in France, you probably know this magazine. But why don't we have something like this in English? I haven't seen any in the US anyway - Britain? I don't know how real teachers do it. After a few full days of teaching a software seminar here in Paris, my brain is fried, and I barely have the energy to deal with email let alone blog. Could jet lag and Beaujolais contribute to this effect? Perhaps a little. In the meantime, the roll of space bloggers that I added to my site continues to grow, with many interesting entries (automatically generated, no energy required from me). With RSS feeds and Foxfire's "live bookmarks" it's easy to keep an eye on what's new. I really enjoy the enthusiastic posts of Sector 4 Command, the humor of some recent posts at Bad Astronomy Blog, and several others that help me keep up with space news. And although it's too eclectic to call a space blog, Anthonares is always thought-provoking and a good read. A continuing favorite. For Orbiter fans looking for something new and fun to do, I'd suggest a look around Virtual Spaceflight. There are some really good scenarios and tutorials over at Andy's site. JPL's Solar System Simulator page is the quick way to check. 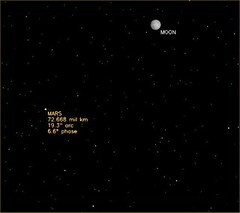 Enter the date and time, "Mars seen from Earth," 20 degree field of view, et voila. 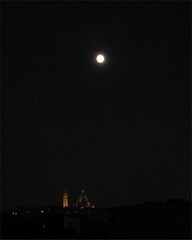 Yes that was Mars, 72.668 million kilometers away (Sacré Cœur was about 3 km). Click the pictures for bigger versions available on Flickr. The Space Review is one of my favorite space sites, a weekly web magazine with articles, opinion pieces, and reviews that go beyond the quick reaction to news events. With contributions from various guest writers (as well as editor Jeff Foust), The Space Review provides background, depth, and perspective on space developments. So I was especially pleased when The Space Review accepted my proposal for a review of Orbiter. The article appears in today's issue. 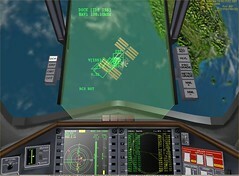 The picture above is one of the two illustrations in the article, a view of the International Space Station from the virtual cockpit of Orbiter's "Delta Glider" space plane (this version has a link to my Flickr picture site which has larger versions of this and many other Orbiter screen shots). If you are visiting from the link in The Space Review article, welcome. I hope you found the article useful. If you have any questions about Orbiter, feel free to ask me here, or better yet, visit the Forum where the real Orbiter experts hang out. 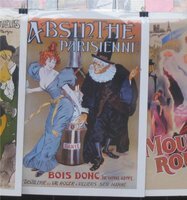 Actually I haven't drunk any absinthe here in Paris (yet), though I read recently in a Wired Magazine article that it's now legal and fairly safe to do so in France (all things in moderation). So maybe I will. Meanwhile I have a training seminar to prepare for, and what better preparation (?!?) than a visit to the always impressive Musée d’Orsay. Love those Impressionists, though alas the cloudy weather meant that the natural light was a bit dim for flashless digital photography - with slow shutter speeds, the Renoir nudes look even fuzzier and pinker than usual. And oh yeah - sorry about that headline! N.B. I learned that absinthe is not exactly flowing in the streets of Paris. At dinner tonight (Monday) I asked the waiter about it, and he said it's not legal to sell it here. Oh well. Nothing very space related in this magnificent former train station full of nineteenth and early twentieth century art, but I did find an oddly arresting Moon image in a dimly lit pastel display room, a work by the Belgian artist Leon Spilliaert entitled Clair de lune et lumières. The nearly full Moon looked much like this on the way to dinner tonight. There are many fantastic works at the Orsay, but this little pastel somehow stuck in my mind. While I'm not as systematic about it as DarthVader in his "Fly Me to the Moon" blog, I too am exploring the wonderful Apollo add-on for Orbiter (NASSP 6.4.2). Although it still takes me minutes to find the right switches on the CM or LM panels, thanks to "Saturn V" (Don Hagerty), I can still experience the key moments of historic Apollo missions. He has posted scenarios for Apollo 7, 8, 9, and 10 at Orbit Hangar. 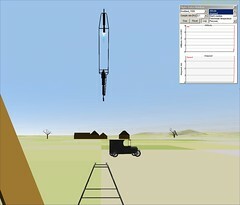 Each zip file contains historically accurate scenarios for many points in the respective missions. For example, the crew of the Apollo 10 Lunar Module experienced a "staging anomaly" (caused by some incorrect switch settings) which caused the LM to tumble when they were about to separate the ascent stage from the descent stage in low lunar orbit. Commander Tom Stafford was able to recover from this, and now so was I! I also docked the CSM with the LM. The picture above shows the Apollo 8 CSM in lunar orbit on Christmas Eve 1968, right at the time the crew made their famous readings from Genesis (the sound for that is not included in the scenario, though it probably could be!). Thanks to the NASSP team and to Don for making it possible (and even fairly easy) to recreate parts of these historic missions. More pictures at Flickr. On my flight to Paris last night, I finished a detailed reading of The Space Elevator by Bradley Edwards and Eric Westling (I praised the book in an earlier post based on skimming it and reading a few sections). This 2003 book is a real tour de force that describes and analyzes the coming technology of space elevators with great clarity and detail. The amazing thing is that the space elevator (SE) is now not so much a problem of waiting for scientific breakthroughs as it is solving a lot of challenging but not unprecedented engineering problems (and getting the funding). The main technical breakthrough took place in 1991, with the discovery of carbon nanotubes (CNT). This material has many useful properties and a growing list of applications, but for SE applications, its main strength is its... strength! It's incredibly strong and light. Within the last few months, I read of a technical breakthrough in the rapid fabrication of CNT ribbons and sheets of the type needed by the SE at a prototype rate of 7 meters per minute (published in Science magazine, August 19). These prototypes are very strong but not yet strong enough, and this is not fast enough for the thousands of kilometers of CNT ribbon that will be needed for the SE -- but it's a huge advance over previous methods of making CNT composites. I also learned about the LiftPort Group a few weeks back -- a commercial venture that is developing SE technology now. They have begun to test early versions of the robotic "climbers" that will pull themselves up the ribbons and eventually to space. Their small test lifters recently climbed 1000 feet (305 meters) up a balloon-suspended test ribbon. Here's the thing. Rockets are cool and have gotten us where we are today in space, but chemical rockets can never be an efficient and cost-effective way to get large cargos and people to space on a routine basis. The Earth's gravity well is just too deep, and a huge fraction of any rocket has to be fuel. The space elevator is the solution. It will eventually make access to low Earth orbit and beyond as routine and cost-effective as international airline flight is today. The astounding thing is that "eventually" is not centuries or even decades. We could have these things in 10-15 years. The benefits will be enormous. This is not science fiction, boys and girls. Although I never served in the military myself, I'm proud of my three brothers, who all served in the 1980's, two in the U.S. Air Force, the third in the U.S. Navy. I'm also proud to say that my late father, Richard Irving, was a U.S. Navy sailor in the Pacific during World War II. He served as a gunner's mate on a landing-craft support ship which saw heavy action at Iwo Jima and Okinawa. Since his death in 1988, I have often wished I could have learned more about his experiences. Like most veterans of "the greatest generation," he didn't talk about it much. My father in law, Charlie Cook, is also a veteran of World War II, and he too is pretty quiet about it for the most part. But partly because of my strong interest in flying, and the fact that Charlie was a B-24 pilot in the South Pacific, I asked him about it, and he gradually opened up and agreed to talk about his experiences. He also shared a number of photos that he kept from his flight training days in 1941-42 (example above, B-17 in formation flight - he first trained in the B-17 before being transferred to the B-24). In the fall of 2000 (when Charlie was 80 years old), I interviewed him and wrote an article about his experiences. My friend Peter Inglis has hosted Charlie's story as part of his Flight Sim Museum (and as a PDF, new window) since then. He did the job, took care of his crew, and suffered badly from the stress, but never asked for any special thanks or credit. We owe a lot to Charlie and the people like him who did so much at such a young age during World War II – we live in freedom and prosperity today thanks largely to the work of men like him. I want him to know that I and many others are very grateful for his service and for his sacrifices. I'm also grateful for the service and sacrifices of all the other thousands of men and women who have served in the military in the past, and who continue to serve today, doing important and often difficult and underappreciated jobs.